A group of more than fifty Korean players will be attending – and competing in – the 2009 U.S. Go Congress in Washington, DC, Thomas Hsiang reports. 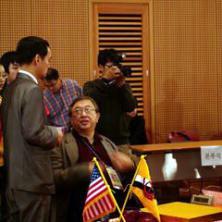 Hsiang, the American Go Association’s Vice President on International Relations, helped arrange the Korean group visit and adds that “several leaders in the Korean Amateur Baduk Association have expressed interest in joining this group to hopefully inaugurate a permanent link between the US and Korean Baduk communities.” Strong Korean players have been a fixture of the European Go Congress for some years now. Another new development in Korea is the establishment of the “King’s Baduk Academy,” Hsiang tells the E-Journal. “Supported by a number of Korean sponsors, this is a 3-7 year program to train the truly devoted to become pro players and/or go teachers.” Each country is given up to one fully-funded slot for this program and other self-paying slots are available. 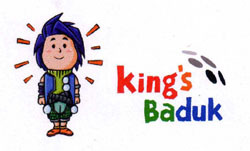 Applications are being accepted through the end of 2008; stay tuned for more information in future EJ reports. The Chinese team is favored to win the Jeongganjang Cup after teenager Song Ronghui (right) 1P swept all five opponents in the just-concluded first stage. The Jeongganjang is a win-and-continue tournament between five-member teams of women pros from China, Japan, and Korea. There are five games in each of three stages (the third stage can be less than five if more than one player remains on the winning team). 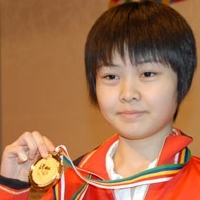 Song, who won a gold metal in the individual women’s section of the recent World Minds Sports Games, defeated Lee Daehyeoi 3P and Lee Hajin 3P of Korea as well as Kato Keiko 6P and Mannami Kana 4P of Japan. Song will still be up at the start of the second stage in January in Seoul, Korea, with the other two teams now down to three players each. Korea still has Park Jieun 9P and Lee Minjin 5P, who are strong players with a lot of titles–Lee took the last five games last year to win the Cup for the Koreans. The Japanese also have experienced title holders yet to play. The Koreans have won this event four times and the Chinese twice. The best result for the Japanese second place in 2007. As noted above (Chinese Taipei Secures Status As Go Superpower), Ondrej Silt of Czechia was the top European at the Korean Prime Minister Cup, placing 5th. 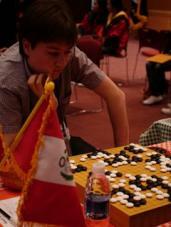 Silt only lost to China and Hongkong and finished one SOS-point ahead of Thomas Hsiang from the US. Frédéric Donzet of Paris, France was the best 5D at 8th place and only lost to Japan and Hungary. Among the five-pointers there were many of the usual 6D suspects from Europe, like Dmytri Bogackyj (Ukraine), Csaba Mero (Hungary), Alexey Lazarev (Russia) on places 13-15 and Merlijn Kuin (17th, Holland). Also two 5D’s did well: Vesa Laatikainen (Finland, 18th) – he defeated a Canadian 7D in the last round – and Lucian Corlan (Rumania, 20th). Surprisingly strong was the performance of Lothar Spiegl (Austria) at 12th place he was the best 4D and lost only to China, Czechia and the Ukraine. Janez Janza (Slovenia) at place 19 was the best 3D. Also two shodans from Europe won five games: Ngoc Cuong Nguyen (Luxembourg, 22) and Dmitris Regginos (Cyprus, 24). Other notable European performances came from Martin Reindl 2D of Slovakia who placed 29th and started with a win against 5D from Rumania, and Francois Gonze 1D (Belgium) placed 31stwhile Pablo Morales (Spain) was 32nd. Also noteworth was EJ friend and fellow go editor Mehmet Barsbey 1D of Turkey, who defeated 3-dans from both Argentina and Brazil. results: Click here for results. CHO TAKES THIRD STRAIGHT MEIJIN: Cho U (left) has retained his Meijin title after an exciting seesaw battle with Iyama Yuta that went the full 7-game distance. After losing the first two games in his Meijin title defense against teen Iyama 8P, Cho 9P then won three straight games to take a 3-2 lead but then lost Game 6 in less than 100 moves. Cho won the decisive seventh game on November 5-6 and so will hold that title for the third year in a row and the fifth time overall. 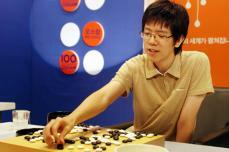 Cho is now in the midst of a major run at the top seven Japanese titles. He already holds the Meijin and the Gosei, and he’s the challenger for both the Tengen and the Oza (he’s won the first game in the Oza title match), and he is in the finals to be the challenger for the Judan. In the Honinbo League, which has just started, he is 1-0. The only one of the top seven he is out of currently is the Kisei, although he came close to winning his section of that League. Iyama is also compiling an impresssive record. He won his section of the Kisei League, but lost the play-off game to Yoda Norimoto 9P; he is still alive in the Losers’ Bracket of the Judan, lost to Cho in the finals to be the challenger for the Oza, and is playing in the challenger’s tournament for the Gosei. TEEN PARK JIYEON IN WOMEN’S MYEONGIN FINALS TO CHALLENGE RUI NAIWEI: Seventeen-year-old Park Jiyeon 1P has won no titles yet, but she now finds herself in the finals of the tournament to determine the challenger for Rui Naiwei (left) 9P’s Korean Women’s Myeongin (Japanese: Meijin) title. This tournament is a double-elimination; after their first loss, the losers play each other in a separate bracket until only one is left. That player then plays the winner of the winners’ bracket to decide who will be the challenger. This year Cho Hyeyeon 8P, who challenged Rui for it five times, winning in 2003 while still a teen herself – and who is also the current Women’s Kuksu – is the winner of the winner’s bracket. She beat Park in the semi-finals of that bracket, but Park won the final game among the losers, so she and Cho will meet again. CHINESE-KOREAN FINALS IN LG CUP: The best-of-three-game finals of the 13th international LG Cup will be between Lee Sedol 9P of Korea and Gu Li (below right) 9P of China. In the semifinals November 5th, Lee knocked out fellow Korean Park Yeonghun 9P, while Gu eliminated Korea’s Lee Changho 9P by 1.5 points. Lee Sedol won this event last year, as well as in 2003, and Gu won it in 2006. Lee Changho has won it four times. Overall, the Koreans have been victorious seven times, the Chinese and the Japanese twice each, and the Taiwanese once. The finals will occur in late February in Seoul.